On the left of the window you can navigate through a calendar to select a capture date, just below this calendar, a grid will let you select a specific picture to be displayed. You will notice that the calendar only displays dates where pictures are available, all other dates will be grey. 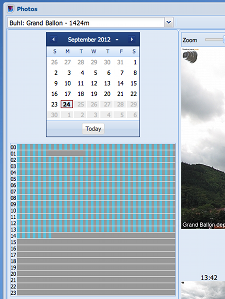 On the hour grid, each blue box corresponds to a picture, if you move your mouse over one of those box the hour will be displayed, if you click on a box it will be displayed on the right part of the window.